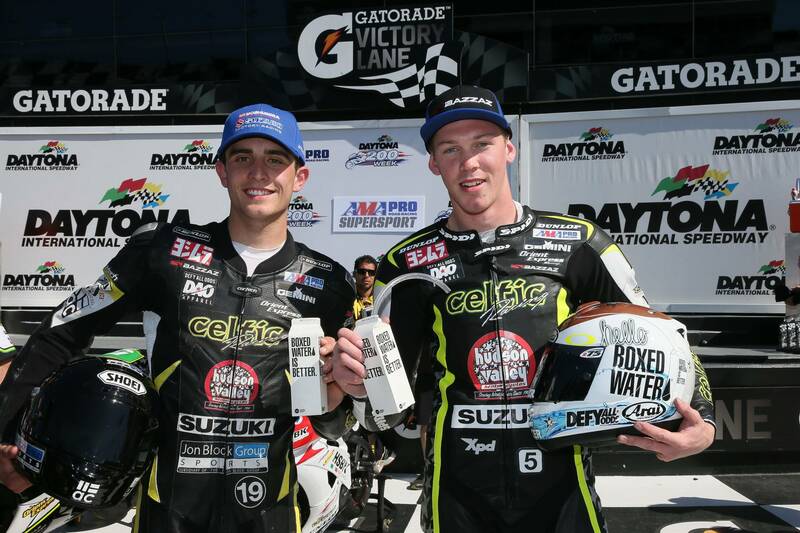 This weekend marks the final stop for the 2014 AMA Pro Racing season, with the Celtic Hudson Valley Motorcycles Suzuki team visiting their home track at New Jersey Motorsports Park. Every season more and more local family, friends, and fans make the trip to the track, and this weekend the Celtic HVMC Suzuki team are planning to put on another good show. Wyatt Farris is in third position in the SuperSport championship going into this final round with 144 points, with Corey Alexander just behind in fourth position with 141 points. The long break since the last round at Mid-Ohio has given the team and both riders plenty of time to prepare, and everyone has been working hard to be focused and ready. Wyatt Farris rode his #19 Celtic/HVMC Suzuki GSX-R 600 to a third place and a fifth place finish at Mid-Ohio, gaining valuable points in the championship, and managing to stay in contention for a strong finish to the season. Farris is eager to return to the saddle, and said “I’m looking forward to getting this weekend started here at NJMP. After Ohio I went home and worked on a few things that I have been struggling with, along with going out to track-days and testing with my crew chief (William Morton). The focus this weekend is to fight at the front and try to get my first win or even two! I have to thank the whole Celtic/HVMC crew for working their butts off for me and I plan on repaying them with result. Along with the team and our sponsors, I would like to thank my personal sponsors that have been behind me 110% throughout this year! Jon Block Group Sports, Above Category, Cortech, Shoei, CT Racing, Defy All Odds and Osmo Nutrition.” You can keep up with Wyatt Farris via Instagram or Twitter @wyattfarris19 or join him on Facebook at www.facebook.com/wyattfarrisracing . 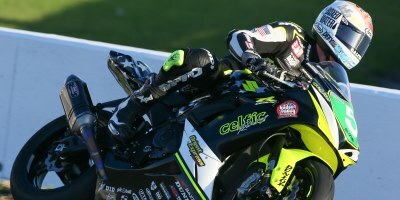 Corey Alexander had a difficult weekend at Mid-Ohio on his #5 Celtic/HVMC Suzuki GSX-R 600, and knows he needs to put in a strong effort to match his early season results and score valuable points at NJMP. Alexander is optimistic and knows that the energy of the team and fans can often make a difference in the results. Corey thoughtfully stated “I have mixed emotions going into Jersey this weekend. I’m excited to be racing at home in front of the northeast fans and back on the bike after a time off. But I’m also still disappointed in the turn that the season has taken for us. Everyone at Celtic Racing has put in such a big effort just to get this program going, not being able to bring them back a championship is definitely a bummer. With that said, the only thing we can do is go out and try to dominate the weekend in front of the home crowd. Who knows! Crazy things happen in racing so don’t count us out completely. Thanks to all my personal sponsors and team sponsors alike!” Corey’s personal sponsors include MJRS Freeman, Spidi Leathers, XPD Boots, Arai Helmets, Boxed Water Is Better, Defy All Odds Apparel, Oakley, Crossfit OSA, and Lapizta Watches.” Please follow Corey Alexander on twitter and Instagram via @corey5alexander , keep track of him on Facebook at www.facebook.com/corey5alexander , and check out his webpage – www.corey23.com – as well. Sponsors for the Celtic/Hudson Valley Motorcycles Suzuki team include: HVMC Racing, Suzuki, MJRS Freeman, Orient Express, Jon Block Group, Yoshimura R&D, Bazzaz, Gemini, K-Tech Suspension, Pitbull, Maxima Racing Oils, Galfer, Chicken Hawk, Motion Pro, Armour Bodies, Saddlemen, Star School, DesignStar3, Zero Gravity, Signs Ink, GB Racing, DID, and Vortex.